Philippine Ambassador to Washington, D.C. Jose L. Cuisia, Jr. said that individuals and organizations in the US who would like to assist in the relief assistance can send their cash donations to the National Disaster Risk Reduction and Management Council (www.ndrrmc.gov.ph); the Department of Social Welfare and Development (www.dswd.gov.ph); and the Philippine National Red Cross (www.redcross.org.ph). Her name was Aimee, a 7-year-old daughter of an overseas Filipino worker who had endured some 24 hours half-submerged in muddy water but died soon after being rescued. She had become the poster girl of the pain and devastation brought by Pablo, the worst typhoon that hit the Philippines this year. In a country where early Christmas cheers would have been the norm at this time of year, tragedy struck with such a devastating swath it left in its wake so much suffering and damage. The grim reaper has a bountiful harvest with more than 500 bodies recovered so far. Blown in the wind; deaths in flash floods. That’s how one newspaper characterized the Category 5 storm that moved swiftly in its predicted path, sending roofs flying off houses, hectares of coconut trees tumbling, rivers bursting their banks, canceling flights and ferry services, church bells ringing and sirens wailing especially in some parts of Mindanao in the early hours of December 4. Eastern Samar, and Western Samar in the Visayas. Provinces in Mindanao that were placed under the storm signal warning were Surigao del Sur, Surigao del Norte including Surigao Island, Dinagat Is., Agusan del Norte, Agusan del Sur, Davao Oriental, Davao del Norte inc. Samal Is., Compostela Valley, Bukidnon, Misamis Oriental and Camiguin. In the aftermath of the storm’s landfall folks in the remote mining and farming town of Bataan, Compostela Valley, were shocked to find that the terrain had drastically changed. A report said that what used to be a field of coconut trees and wooden houses had turned into a gushing river as wide as the Edsa highway belt of Metro Manila flanked by rocks and boulders that had tumbled down the mountain. The estimated cost of damage to property, agriculture and infrastructure may soar to P5 billion or more. The National Disaster Risk Reduction and Management Council (NDRRMC) reported that more than 5.1 million people (or 1,033,364 families) have been affected adversely in 1,862 barangays (villages) in 26 provinces throughout regions 4B, 6, 7, 8, 10, 11, and CARAGA. At least 211,000 people taking refuge at crowded government-run shelters, another report said. 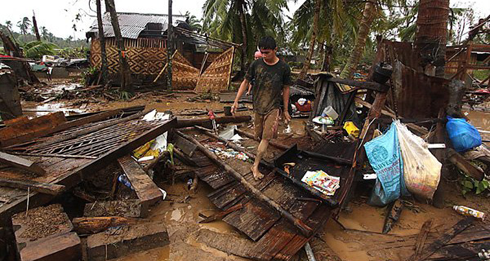 Rescue officials said Mindanao’s east coast accounted for all but 40 of the 546 known deaths from Typhoon Pablo (Bopha). Other fatalities were reported in Palawan – 2, Capiz – 1, Central Visayas –7, Eastern Visayas – 2, Zamboanga City – 1, Northern Mindanao – 11, and Caraga Region – 11. Of the dead less than a hundred have so far been identified and more are missing. Earlier it was reported that at the height of the storm 1,710 passengers, 227 rolling cargos, 79 vessels, and 15 motor bancas were stranded in various ports in the country. Who to blame for the large number of casualties? On Friday, December 7, President Noynoy Aquino III inspected the ravaged areas in Mindanao accompanied by Interior Secretary Manuel Roxas II, Defense Secretary Voltaire Gazmin, Transportation Secretary Joseph Emilio Abaya, Energy Secretary Jericho Petilla, Social Welfare and Development Secretary Corazon Soliman, Health Secretary Enrique Ona, Environment Secretary Ramon Paje, and Presidential Communications Development Secretary Ramon Carandang. They first visited New Bataan and distributed relief packs and P10,000 to each family taking shelter in an evacuation center. “Your government will not stop until we ensure your lives improve and prevent this kind of tragedy,” he was quoted in Pilipino promising the victims of the tragedy that the government would hasten efforts to help them. He also expressed regret that so many casualties occur every time there is a disaster. Why did the tragedy happen and how to prevent it from happening again, he asked. Pope Benedict XVI, in a message relayed by Vatican Secretary of State Cardinal Tarcisio Bertone through the Papal nuncio in the Philippines, Archbishop Giuseppe Pinto, Thursday expressed his solidarity with the Filipino victims of the tragedy. United Kingdom Foreign Office Minister Hugo Swire extended on behalf of the British government his deep sympathies to the families of the casualties and to those in evacuation shelters in many parts of Mindanao. Meanwhile, it was reported on December 8 that hungry and homeless typhoon survivors in the towns of Maparat and Cateel looted shops and warehouses in search of food. Four days after the calamity struck, officials still struggled to bring in food and relief convoys through roads that had been blocked or swept away by floods and avalanches of rock, logs and mud. Officials said damage to roads and bridges by floods and landslides trapped 150,000 people for three days in Cateel and the nearby towns of Baganga and Boston, where they said 97 percent of buildings were flattened or unroofed. About 4,000 residents in the destroyed farming village of Maparat were left to eating fallen coconut fruits, said an AFP report. It said the survivors were sleeping 80 to a room on the bare concrete floor of the local elementary school, sharing the toilet’s two stalls and are doing their washing and bathing at a nearby spring, which is also their only source of water. In dire situations like these it is apparent that people affected need more than messages of solidarity or sympathies. Washington would be releasing $100,000 to the Catholic Relief Services to help victims of Typhoon Pablo (international name Bopha). Reports also said the US Agency for International Development (USAID) will be sending assessment teams to typhoon-affected areas to determine where the assistance is most needed. Ambassador Cuisia said that Washington has provided $11.7 million in humanitarian assistance and over $4.1 million in disaster risk reduction activities to Manila since 2007. (www.ndrrmc.gov.ph); the Department of Social Welfare and Development (www.dswd.gov.ph); and the Philippine National Red Cross (www.redcross.org.ph). The International Federation of Red Cross and Red Crescent Societies (IFRC) is reportedly targeting 3.7 million euros to help the Philippine Red Cross (PRC) support families displaced by the typhoon. The money will be used to provide immediate food and non- food relief items to the victims and finance their recovery through providing water and sanitation systems, cash grants to help restore livelihoods, and materials to rebuild homes. The Inquirer reported that cash and relief goods for the victims had poured in from foreign donors. Canada announced that it was giving P10 million (Cad$ 250,000) through the Canadian International Development Agency (CIDA) to the International Federation of Red Cross and Red Crescent societies to address the emergency needs of the people affected by the storm. In addition, a United Nations disaster and assessment team, which includes a Canadian delegate whose deployment is funded through an ongoing CIDA project, has been deployed to provide direct support with the rapid needs assessments. P210 million (A$5 million) in assistance to the Philippines for the conduct of relief operations. ABS CBN Foundation International announced that it is currently accepting donations to assist in rescue operations and providing aid to over 86,000 families that are now in evacuation centers. Contributions can be made to “ABS CBN Foundation International (Typhoon Pablo)” online at www.abscbnfoundation.org or via checks to 150 Shoreline Drive, Redwood City, CA 94065. Boxer-politician Manny Pacquiao, who was scheduled to fight against Mexican Juan Manuel Marquez Saturday, has pledged support for the victims of the typhoon. In Los Angeles, Maria Amor Torres of the Exoti Group of Companies has informed PinoyWatchdog.com that the 3rd Annual Exotifit Christmas party will raise funds to be donated to our countrymen who are in pain and desperation as a result of the worst typhoon that hit this year. She posted this in her Facebook page. Willo Lim, president of the Sto. Nino de Cebu Association of Southern California, also informed that a donation box for the victims in Cateel, Davao, will be provided during the organization’s Annual Christmas Dinner Dance on December 8, at the Crowne Plaza Hotel & Commerce Casino, City of Commerce. Songstress-entertainer Malou Toler sent in this email: “Yes, we are scheduling it for Dec. 27, I’m gathering artists and Evelyn is working on the venue.” Ms. Toler, a familiar sight in fundraising causes, is contacting artist friends to join in the humanitarian undertaking. Civic and church leader Pex Aves also volunteered to make representation with Councilmember Elito Santarina of the City of Carson to initiate a fundraising towards this end. A December 7 press release from the Dept. of Labor and Employment says that Secretary Rosalinda Dimapilis-Baldoz ordered the release of an initial P5.5-million funding for emergency employment and livelihood of workers who were displaced by typhoon Pablo in Caraga Region and Compostela Valley, particularly in the town of New Bataan. In a briefing with the president held at the Davao International Airport, NDRRMC Executive Director Benito Ramos said the Metropolitan Manila Development Authority has already sent potable water to New Bataan, Compostela Valley. Albay is also giving water to the typhoon victims. The Dept. of Social Welfare and Development will coordinate where to locate the water supplies for easy access of the people, Secretary Dinky Soliman said. Dept. of Health Secretary Enrique Ona informed that they have already distributed chlorine tablets where there is no safe drinking water yet as well as medicines to affected areas. Ona admitted there are some problems in distributing medicines because many devastated areas are still inaccessible. The Dept. of Trade and Industry is also doing price monitoring in coordination with the Philippine National Police to prevent traders from jacking up their prices. The government is also spearheading a “Diskuwento Caravan” to provide the people with affordable basic necessities.